What’s in style as the weather begins to get colder? Hope Harley prepares for the weather with fall colors. Hope Harley was wearing a long sleeve black lace dress with lace leggings. She has a mustard yellow scarf and brown shoes with rings as accessories. Harley says that during the Fall/Winter season she likes mixing simple long sleeve dresses with leggings and scarves as a simple but fashionable statement. Leslie Cruz sported a trendy KAWS x Sesame Street collaboration shirt. 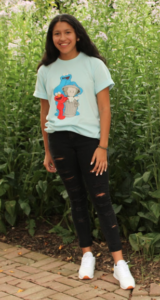 Leslie Cruz was wearing a Sesame Street x KAWS collaboration shirt with ripped black jeans and white shoes. KAWS is an influential streetwear artist that does collaborations with iconic brands while putting his own stylistic spin on clothes. Cruz said her sister worked at a store that sold streetwear and highly desired fashion including big names such as Supreme. Tahar Ahman rocks the band shirt with an acid wash jacket and camouflage pants. Tahar Ahman was wearing an acid wash jean jacket with a black band shirt, camo jeans and Nike Air Force shoes. All of these are considered to be in style, but Ahman took a unique spin on the trending fashion. 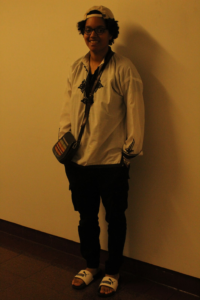 Ahman tended to rely on weather and first instinct when deciding what to wear for the day. Mckenzie Stewart stays comfortable and fashionable in Puma slides and a shirt from Morocco. Mckenzie Stewart sported a uniquely fashionable outfit, informing that her shirt was from Morocco as a gift. She wore a Tommy Hilfiger hat backwards, cargo pants, Puma slides and a over-the-shoulder bag. “Mostly everything I’m wearing was given to me as a hand-me-down or a gift,” Stewart said. Big brand slides like Puma, Adidas and Gucci are just a few examples of those jumping on the trend of branded slides, mixing comfort with style. Ibrahim Ceesay used a unique color scheme rocked from head to toe. 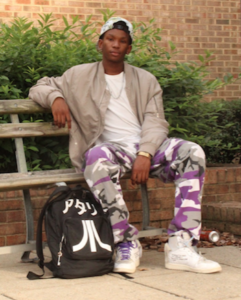 Purple camouflage pants with matching Nike Off-White shoes makes a bold statement. Ibrahim Ceesay sported a bold look from head to toe, starting with a pair of Nike Off-White sneakers with purple shoelaces that he said were actually from out of the country, as sometimes higher demand items like this can be hard to come by in the States. Simple supply and demand shows us that high demand items with low quantity usually leads to higher prices and overall less availability. Sometimes people will buy big brand items from out of country to help with price and accessibility. 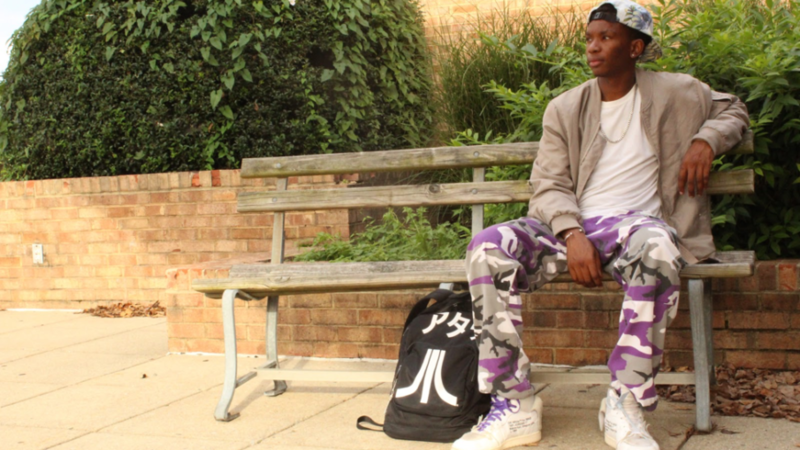 Ceesay wore a pair of purple-colored camo pants that matched his shoes, creating a unique color scheme of purple, gray, white and black. For Ceesay’s shirt, he wore a plain white tank top with a neutral color jacket and a chain to accessorize. To finish the outfit, he had a Japanese Atari backpack. Black clothing with bold white lettering, often in another language, is considered fashionable and a type of streetwear. 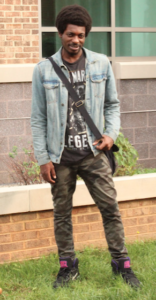 Ceesay says that comfort definitely plays a role in his decision on what to wear, but even then he makes sure to accessorize with a belt or something special to make that statement. Among those interviewed, comfortability was important and they like to make fashion statements when possible. 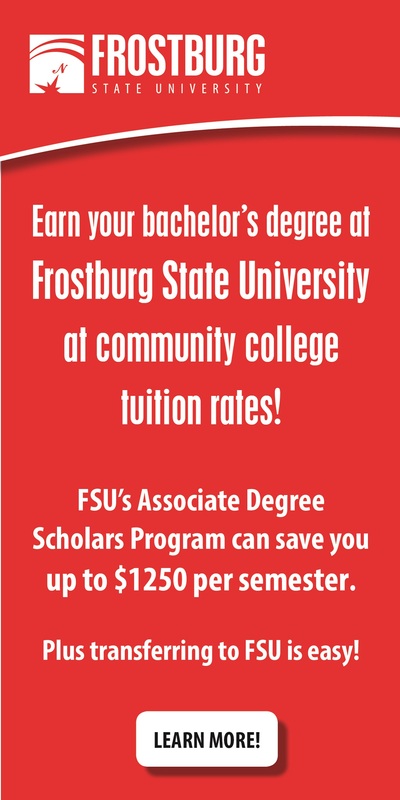 Although fast fashion can sometimes be inaccessible either through quantity or price, it still seems that students at FCC are able to find the means to stay stylish in a reasonable and savvy way. Many students also informed that some of the clothes they were wearing were actually gifts.